The map might have STA, I'm not sure. So 18k with 3 bases or 23k with 2? I like the concept, though I think the map has a lot of problems that are currently impeding the execution. The airport position is way too forward, it'd be better if the piped off area exoted near the preowned base rather than the opposing base, and there is almost certainly FTA (due to how long it takes for the piped off base to come into play. That being said, the question posed is interesting: is unit count or unit value more valuable? Without the airport I would always choose the three bases, but with the airport the 2-base side can actually gain a vehicle advantage by cranking out a copter every turn. I feel like this depends a bit on CO choice because of that, and so the answer is not clear cut for all situations. But in general I would say that if you can gain a vehicle advantage and afford the loss of shielding units, you should choose the funding advantage. I will change the map after the current test games are done. I don't quite understand why one is better than the other. This time your opponent decides what you get. theether wrote: I don't quite understand why one is better than the other. The main reason I said that is because the current exit is almost right on type of the opponent's base. It leaves basically no possibility for tactics or positioning - anything that is moved out will instantly attack or be attacked by something. Most likely by the time you break the pipe, your opponent will have full control of that area and it will be very difficult even to get anything other than mech spam out of the piped area. Moving the exit nearer to the preowned base allows more unit movement options, which leads to more fluid and complex gameplay in my experience. 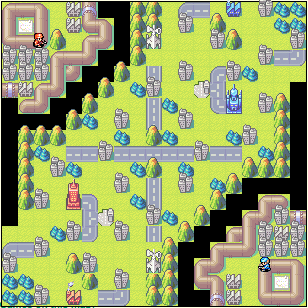 Of course, the risk with moving the exit is that the map will turn into a one-front game in the middle. Unfortunately I think the map is too small (or has too much of the corners taken up with the piped section) to avoid this entirely. Making the piped section smaller and tweaking the exit so that it comes out at an area where it sets up a second front, while still maintaining a little distance from the preowned base is ideal. Edit: By the way, have you seen my map Stormiest Glen? It explored the same type of idea as your map. Headphone also made a map with a similar concept but I can't remember the name off the top of my head. Wait, but the black area does end near your own HQ. So apart from Infantry and Mechs which you can send over mountains, shouldn't it already be a one front map? Oooh, so you say it would be better if I moved the preowned base towards the end of the black area so that sending Infantry and Mechs over the mountains becomes more viable? Your map looks great by the way. And here I thought I was the first to build that kinda gimmick into a serious map. The second paragraph is still relevant though. I'm not sure where the best location for the outlet is, but ideally I think you want the main fighting to be between the preowned base and the piped section (so units from OS's piped area mainly fight units from BM's preowned base. Then include terrain such that switching fronts and supporting from the other base is still possible. You can't really do this without widening the fronts out thoigh, which requires making the piped area smaller. With regards to infantry and mechs, I personally would prefer them to have fewer routes than the current "access any point on the blacked area equally". But I think that's a stylistic thing, just depends what sort of gameplay you want to encourage. I guess I'll have to change the map quite a bit to make it more interesting. Thanks for your honest criticism.